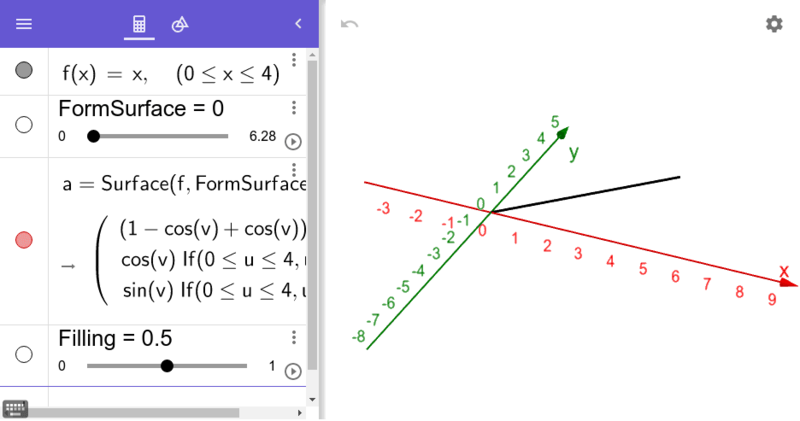 Here, you can use this template to create a function (f), and rotate it about the xAxis (by using the FormSurface slider). The Filling slider adjusts the opacity of this surface. Note the surface of revolution formed. You can change the phrase "xAxis" to "yAxis" to rotate the graph of function f about the yAxis instead. 1) To explore in Augmented Reality, open up GeoGebra 3D app on your device. 2) Go to the MENU (horizontal bars) in the upper left corner. Select OPEN. In the Search GeoGebra Resources input box, type qgcz82ae (Note this is the resource ID = last 8 digits of the URL for this resource.) 3) Position what you see accordingly on your device. Press the AR button in the lower right corner. Follow the directions that appear.